This is a simple to follow Recipe for making at home sweet and tasty Godi Sev or Sweet Sev for Diwali Faral. 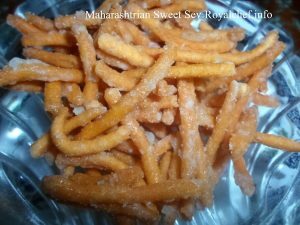 This is and uncommon Maharashtrian Style Sev Recipe, which can be used to add variety to your annual Diwali Faral Sweets. 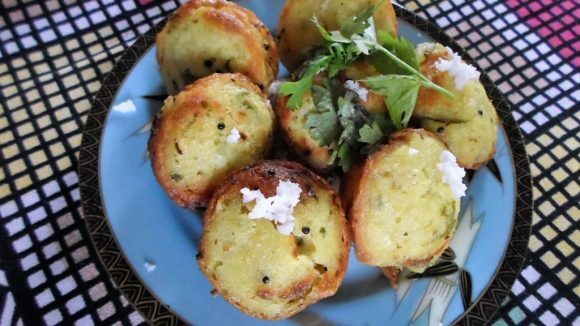 For the Sev: Sieve the Besan, Rice Flour and Salt and add the hot Oil, Butter and mix it well and then add the Water slowly as per requirement and prepare a Soft Dough. Heat the Oil in a Kadai. Take a Sev Maker Mold and insert the Dough and directly put the Sev in to the hot Oil. While preparing the Sev keep the flame on the higher side and then turn the Sev over and deep fry the it on a slow flame until the color changes into Golden. Then remove the Sev and keep it on Paper for draining the excess Oil. Prepare the remaining Sev till the Dough is completely used, using the same procedure. Then break the Sev roughly. For the Sugar Syrup: In a big size Kadai add the Sugar and Water, mix it well and prepare a thick sticky Syrup. Then add the broken Sev into the Sugar Syrup and toss the Sev gently until the Sugar Syrup cool down. After the Sev cools down, store into an air tight container.